The 10 Best Bike Shops in Delaware! Have you been longing to take a bicycle ride through the countryside? It’s time to fix up your bike. Get essential tune-ups or purchase a new ride entirely at the high-quality bike shops of Delaware. No matter fall, spring, or summer, Delaware is a beautiful place to go for a bike ride. These 10 shops will help you find the best ride, equipment, and gear to enjoy it as fast as your legs (and bike!) can take you! Bike to Go in Rehoboth Beach has been a destination spot for bike rentals and sales for over three decades. They have everything you could need from accessories to parts, clothing and safety equipment. Not sure where to bike? They even provide tours and map out tours for you to try for yourself including distance, time and degree of difficulty. Seagreen Bicycle is one of the most customer service oriented bicycle shops in the state of Delaware. They have been known to help customers with the acquisition of rare parts while stuck with a broken bike on vacation, rescue a cyclist who lost the key to their bicycle lock, and help repair bikes as quickly as possible so cyclists can get back on the road again and enjoy the local beach scenery. The Bicycle Connection in Bethany Beach takes a genuine interest in getting their customers set up with the right bicycle and equipment in their budget. With roots in the area, the staff offers advice on riding trails, charity races, and more. They offer bicycle brands such as Trek and Electra, and have bicycles in every category such as road, mountain, Cyclocross, commuter/urban, comfort, cruiser, fitness and more. According to their site, Bethany Bike Shop is “Delaware’s Beach Cruiser Specialists,” and if anyone has ever driven by, they have noticed the 50 or so cruising bikes lined up outside ready for cyclists to rent and enjoy in the Delaware beach area. If you’re looking to purchase a bike, Bethany Bike Shop also sells Jamis Bikes as an exclusive Delaware dealer. Not sure if you want to buy? Rent the bike you are interested in and see if it fits you. The rental rates are located directly on their website. As a family owned bicycle shop, folks can come back to Garrison’s Cyclery again and again and see the same staff for their bicycle needs, advice and expertise. Garrison’s Cyclery is heavily involved with the local race scene and has plenty of information on races including dates and times, and can even recommend some of the best equipment for those races. Garrison’s deals in over 30 bicycle brands that you can browse online. While you’re on their site, check out their journal for sweet tips on races, behind the scenes information, and news about Garrison’s Cyclery. 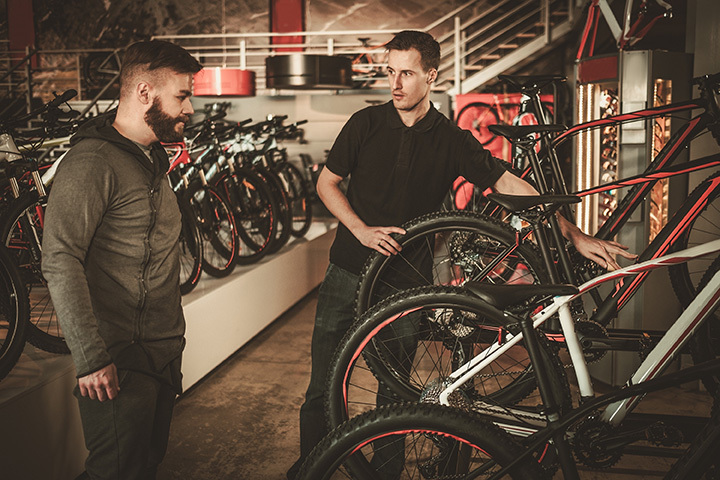 When someone is ready to purchase a bicycle they want to go to a bicycle shops with plenty of stock, knowledgeable staff, and excellent customer service. Wooden Wheels in Newark strives to take the guesswork out of buying a bicycle by helping you with the perfect fit and they even provide equipment service long after the purchase is made. Check out their daily video tips on their website for useful information as a Delaware bicyclist. Have you been searching for a local bike shop to incorporate into your life for good? How about a location that hosts group rides for beginners? Newark Performance Bicycle Shop is one of the largest bike shops in Delaware and is part of the White Clay Bicycling Club. They offer advice on over 35 miles of trails in the area, the correct equipment to purchase, and of course, the best bicycle for your budget. Expect nothing but the best at the Newark Performance Bike Shop. Henry’s Bike Shop is more than just bicycles. Henry’s shares the latest news on gear, service, bikes, local trails, and even provides maintenance classes on how to support and maintain your bicycle and equipment for a long life of happy trail riding. They also provide classes on how to ride a bike (great for beginners), trail etiquette, and information on races and events. As one of the newest bicycle shops on the Delaware scene, Lifecycle is taking the cycling world by storm. Providing classes to the public on the latest riding techniques, celebrating sweet victories with their customers, and supporting Sussex county in charity races and fundraisers, Lifecycle is quickly becoming a favorite amongst locals and tourists alike. Pedal Works is one of the most serious bicycle shops around. As a full-service bike shop on the DelMarVa peninsula, Pedal Works offers everything from bicycle fittings by appointment, a variety of specialty bikes, professional cycling advice, and exclusive clothing and accessories. Whether you are looking for better timing for the next race, a more comfortable fit for when you are out on the trails, or even the best shoes to wear so you can cycle longer than ever before, Pedal Works Cyclery is the one-stop shop for all your cycling needs.